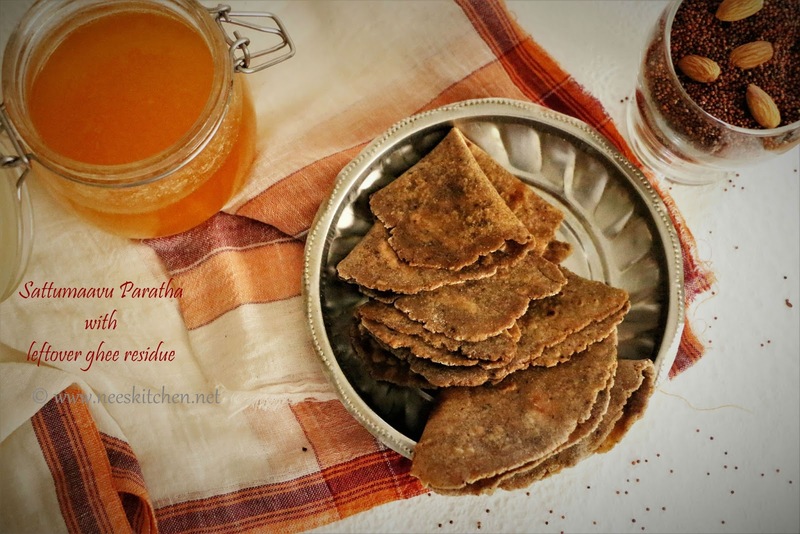 Nei kasandu with sattumaavu paratha is miraculous transformation of ghee residue and millets into addictively delicious paratha loved by all age groups. This recipe is a big “NO NO” for diet watchers and ideal for kids. Refer to my Ghee recipe for ghee preparation. For this recipe, it is good to prepare on the same day of making ghee. 1. Prepare Ghee in a heavy bottom vessel and sieve it from its residue. Store in a container. (Refer to Ghee Preparation Link). 2. 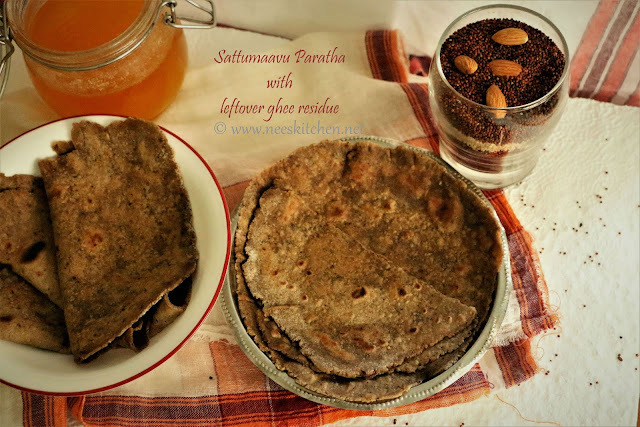 If the pan is not hot, heat the pan which has the ghee residue and add 1 tsp of ghee to it. 3. When the pan becomes warm, scrap the ghee residues which could be stuck to the pan. Make sure the gas is very low. Gather all the residues in the middle. You could see some ghee along with its residue. Let this cool. 4. 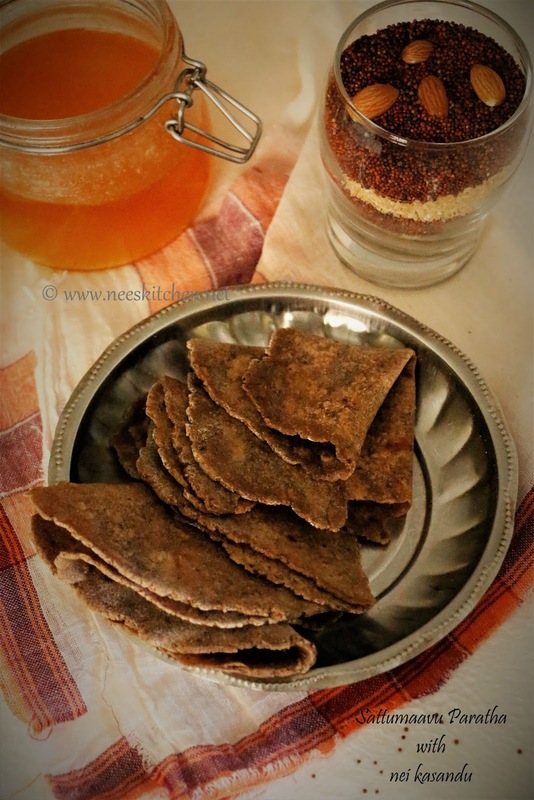 Add sattumaavu (equal proportions of finely powdered ragi,bajra & jowar and few almonds) and whole wheat flour to the nei kasandu and mix well. No need to sieve. 5. Add salt to the flour, combine them and slowly add water to form a soft yet slightly firm dough. Knead well .Cover with damp cloth and let it rest for 20 minutes. 6. Divide into 6 large lemon sized ball of dough. 7. Dust the working surface with some atta and roll out the dough to form 5″-6″ diameter circles. 8. Heat a iron tawa and once its hot, add 1/2 tsp ghee. 9. Place a paratha and let it cook for 20 seconds. Flip the paratha and let it cook for a few 20 secs. Keep repeating until light brown spots appear and golden shade on both sides. Use a spatula to press the areas which are puffed as the paratha gets roasted evenly. 1. Almonds in sattumaavu is optional. 2. The number of paratha’s varies based on the size of parathas.